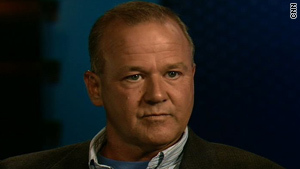 Ex-Scientologist Marty Rathbun says he was pressured to beat people by church leader David Miscavige. Note to readers and viewers: The Anderson Cooper 360 series "Scientology: A History of Violence," which reported competing claims and denials about violence at the top of the Church of Scientology has attracted a number of complaints from senior members of the Church of Scientology (including Mr. Miscavige) and the Church of Scientology itself. The series is now the subject of a letter of legal complaint in the United Kingdom. The complainants strongly dispute the allegations and the assertions made against them and covered in the course of the series by former members of the Church of Scientology. Los Angeles, California (CNN) -- If you believe Marty Rathbun, people in the top ranks of the Church of Scientology have used physical intimidation and outright beatings as a means of discipline. Scientology's current leaders, including Rathbun's ex-wife, call him a liar and an "apostate." They say the only beatings were those inflicted by Rathbun and a small number of others, all of whom have left Scientology. But both sides appear to agree that periodic beatings occurred among the highest echelons of the church for some period of time, though they disagree on who was behind them -- and none of those involved ever filed a police report. Church leaders say the issues were taken care of privately. "We have our own internal methods of handling somebody," said Norman Starkey, a senior leader in the church and a former close associate of Scientology's late founder, L. Ron Hubbard. "If someone acts a bit irrationally, it was reported. It was reported internally." But Rathbun said no one would report the beatings because they came from the top, and sometimes they were inflicted by his immediate superior, church leader David Miscavige. "In late '03, there was a beating every day," Rathbun said. "And if it wasn't from him doing it, it was from him inciting others to do it to others." The Church of Scientology emphatically denies any allegation that Miscavige, who became Scientology's leader after Hubbard's death in 1986, either beat his lieutenants in the church or fostered a management culture that encouraged physical abuse. In fact, in sworn affidavits, a number of church members point to more than a dozen instances in which Rathbun assaulted colleagues over the years. Video: Allegations of abuse: What's the truth? Rathbun was behind "a very carefully calculated campaign to engage in individual acts of bullying, and sometimes, you know, of a very forceful nature, in isolation," church spokesman Tommy Davis told CNN. Rathbun's accusations are supported by other former members of the Sea Organization, the elite religious order that runs Scientology. They describe Miscavige punching, choking and kicking top aides, including the church's onetime spokesman. But current members of the group deny those claims and say some of the accusers joined Rathbun in the abuse. Rathbun quit Scientology in 2004 after belonging to the church for more than a quarter-century. During that time, he rose to the rank of "inspector-general" and was a member of the Sea Organization. He is the highest-ranking former Scientologist to speak against the church. He admits to abusing his own subordinates. But he says he was encouraged to do so by Miscavige. "He used to rag on me all the time, constantly pushed me to get physical with people and berate me," he said. Through Davis, Miscavige declined to be interviewed by CNN for this report. There is no physical evidence to support the accusations against him, just as church affidavits attacking the accusers and supporting Miscavige cannot be independently verified. The Church of Scientology's stated goal is to help people "live in a civilization without insanity, without criminals and without war, where the able can prosper and honest beings can have rights." Members pay to take courses designed to help them work through issues from their past and reach a higher state of consciousness. Scientology has a vociferous array of critics, and responds with forceful public relations campaigns and legal defenses. Davis said Miscavige demoted Rathbun in 2001, immediately after reports of physical assaults on subordinates reached him. The church now accuses Rathbun and other former Sea Organization members -- including onetime Scientology spokesman Mike Rinder, construction manager Tom DeVocht and marketing manager Jeff Hawkins -- of conspiring to spread lies about Scientology. Rinder would not appear on camera, but said he was the subject of Miscavige's abuse about 50 times. Both Hawkins and DeVocht say they were victims of Miscavige's violence as well. But Rinder and DeVocht actually took part in the abuse, the church says. DeVocht wasted church money, it says, while it accuses Hawkins of supporting an anti-Scientology organization known as Anonymous. The ex-wives of all four men, all of them Sea Organization leaders themselves, joined church officials in denouncing them during joint interviews with CNN. "He is the one who turned on his friends and his wife," said Rathbun's ex-wife, Anne Joasem. "People who turn on their friends are liars." Rathbun and others say Rinder bore the brunt of Miscavige's attacks. But Rinder's ex-wife, Catherine Bernardini, said the only time she saw any sign her husband had been beaten was when he was attacked "totally out of the blue" by Rathbun. DeVocht's ex-wife, Jennifer Linson, said she "never saw one scratch" on her husband. And Hawkins' ex-wife, Catherine Fraser, said he "never mentioned one thing" about any abuse. "To the contrary, he mentioned to me how much Mr. David Miscavige supported him, how much he believed in him," Fraser said. Church officials have provided CNN with a stack of affidavits attacking Rathbun and other ex-Scientologists. In one, Starkey states that Rathbun subjected him to "consistent and virulent physical harassment" from 1997 to 2002. "He would walk up to me and slap me across the back of my head, then deal me a resounding blow or without warning, brutally hit me on the head from behind," Starkey wrote. But Starkey said he never told Miscavige, Rathbun's superior, about those assaults. Nor did Guillaume Lesevre, the church's international executive director, who said there was never any "culture of violence." "Sure, Marty Rathbun lost it. Several times, he lost it," Lesevre said. "He was a guy who had a tendency to be like this." Lesevre told CNN that Scientology has "our own procedure" for dealing with problems, "and maybe there is one thing we have a fault on." "We are very tolerant with people. Particularly when we have a staff member who's been a staff member for many years, like Marty Rathbun was," he said. "We give them a lot of chances." But in the end, Lesevre said, Rathbun "would not avail himself of it." Davis told CNN the question of whether anyone in the church filed criminal charges "was completely their choice." But Hawkins told CNN that no one within the church would challenge Miscavige. "If you're a Scientologist and you believe in Scientology and you believe that the only way to your spiritual salvation is through the levels of Scientology, then he literally holds the power of life and death over every Scientologist," Hawkins said. "Because he can say, 'You're out of here, you'll get no Scientology services, you're done.'" Hawkins spent 35 years in Scientology before he left in 2005. He compared church members to a "battered wife" who would lie to police if questioned about their bruises. "They're not going to say anything," he said. One reason for that, he and others tell CNN, is that the church will force their families to "disconnect" from them if they're out of Scientology. Citing his own circumstances, Hawkins said Sea Organization members, who get room and board on the grounds of Scientology's world headquarters outside Los Angeles and are paid $50 a week, find disconnection particularly difficult. "Here I was, 58 years old when I left. I had no money, I had no job, I didn't know anybody outside of Scientology. I had no friends," Hawkins said. He said that he was declared a "suppressive person" -- a church term for an enemy of Scientology or its principles -- and the church presented his wife with divorce papers. She signed them; so did he; "and we haven't spoken since," he said. Fraser denies her divorce from Hawkins had anything to do with his decision to leave the church and said she has tried to contact him without success. "He paid for the divorce. He knew exactly what was happening. This is astonishing. He is a liar to the core," Fraser said. Bernardini said Rinder decamped at the end of a business trip, sending a message through an intermediary that he wanted her to join him. She refused, and told CNN she has never heard back from him despite repeated attempts at contact. "I had no idea when Mike left, when I was packing his bags, that I would never see him again," she said. "And I was shocked. I was like, 'What the hell is going on, right?' "
Linson said DeVocht also left without warning. "We did not do something to these men," she said. "They walked out on their wives, and they walked out on their church, and they walked out on their friends." But other former Scientologists say their families were pressured to cut off contact with them when they quit Scientology. Amy Scobee, who once helped run Scientology's celebrity center in Los Angeles, told CNN her mother was told to disconnect from her when she quit the church. "In fact, I was at her house when Scientologists came with the issue," Scobee said. While she waited in a back room, she said, church officials told her mother to cut off contact. "So she told me that she didn't have a choice," Scobee said. "It was the worst day of my life." Christy Collbran, another former senior Scientology member, said she was declared "suppressive" after leaving the church four years ago. She says she still believes in Scientology, but her parents -- who remain in the church -- won't have any contact with her. "You can say, 'No, I'm not going to disconnect.' But then what happens to you is that you can't go into the church, and other people won't speak to you, so there's ways of enforcing this," Collbran said. She said former members find not only their spiritual lives are upended, but "they don't want to lose maybe their jobs if they're working for a Scientologist." The church denies any disconnection policy exists. But Davis said no Scientologist would want to talk to someone who rejected their beliefs. If a relative of a member is attacking Scientology, he said, "The church has the right to say, 'Look, you need to sort that out with your dad and until you do, you're not welcome until you sort that out because your father is viciously attacking the church. So sort that out with your dad, and then come back. If you need some help with that, let us know. We'll assist you with that.' "
"That's the simplicity of it," he said. "Any subject of who someone is in communication with is a personal choice that that person is making themselves." But the church's disavowal of disconnection was one of the reasons Oscar-winning screenwriter and producer Paul Haggis cited last year when he quit the church. "We all know this policy exists," he wrote in a letter to Davis. "You might recall that my wife was ordered to disconnect from her parents because of something absolutely trivial they supposedly did 25 years ago when they resigned from the church." He accused Davis of lying about disconnection in a 2009 CNN interview unrelated to this series, adding, "What else are you lying about?" Davis called the release of that letter, which he blamed on Rathbun, "pretty disgusting." But he said, "Anybody has a right to not be in association with or communicating with somebody who is attacking them."